This is the 4th installment of a 6 article series on the trends and technologies impacting the application of HPC in Life Sciences. Commodity clusters, mentioned above, are typically based on a number of thin rack-mounted or blade servers with limited memory provided on each server. When an application running on one node needs to access the memory on a different node, the application has to communicate with the node where the memory resides and issue special commands to retrieve the desired information. In Big Data situations, this can lead to serious bottlenecks, resulting in excessive processing time or, in some cases, making it impossible to run jobs composed of large, distributed datasets. SGI addresses this and other computational and storage problems inherent in Next Generation Sequencing (NGS) applications by providing a broad technology portfolio that includes coherent shared memory (CSM) and distributed memory compute platforms, along with a full range of integrated storage solutions. Included is the NUMA architecture, a system that links multiple nodes of processors and/or memory over a special high-speed network. Under NUMA a processor can access its own local memory faster than non-local memory residing on other processors or shared between processors. Specifically the SGI solution allows all memory that resides on any node or blade to be completely visible to any of the cores in the system. All data within memory is available using direct access mechanisms, regardless of where the memory actually resides. The SGI UV family of servers is based on the NUMA architecture and provides the full range of CSM capabilities without modifying the existing IT infrastructure. The SGI UV uses standard Intel processors, and runs standard Linux – no need to rewrite code or recompile to achieve top performance as well as compatibility with older applications. The SGI UV 2000 is the sixth generation of the company’s scalable global shared memory architecture. SGI began shipping systems with CSM capabilities with the 64-core Origin systems in 1996. The newest GSM (global shared memory) platform – the SGI UV 2000 – scales up to 256 CPU sockets and 64TB of cache-coherent shared memory in a single system. The platforms are built using the SGI NUMAlink interconnect, which provides the high-bandwidth, low latency and coherence-optimized functionality required by GSM platforms. The NUMAlink interconnect fabric can also be used for efficient communications between OS instances. This supports scaling up to many thousands of CPU cores for shared memory applications, as well as for MPI applications and applications developed using partitioned global address space compilers like OpenMP or Unified Parallel C.
The SGI 2000 features a modular chassis design that allows users to grow their system without adding complexity. A 10U chassis contains up to 16 sockets and 24 threads coupled with an All-to-All NUMAlink network topology. By adding additional chassis – up to four per standard 19” rack – and using Enhanced Hypercube topology, the system can scale up to 256 sockets and 4,000 threads, all operating as a single system. 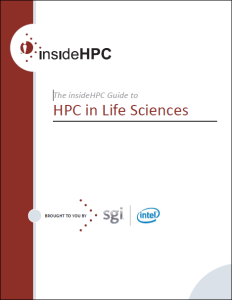 Check back next week for the article on ‘SGI Solutions designed for Genomics.’ If you prefer you can click here to download the insideHPC Guide to HPC in Life Sciences in a PDF courtesy of SGI and Intel.